This article is about the geographic feature. For other uses, see Willamette Valley (disambiguation). The Willamette Valley (/wɪˈlæmɪt/) is a 150-mile (240 km) long valley in the Pacific Northwest region of the United States. The Willamette River flows the entire length of the valley, and it is surrounded by mountains on three sides – the Cascade Range to the east, the Oregon Coast Range to the west, and the Calapooya Mountains to the south. It forms the cultural and political heart of Oregon, and is home to approximately 70 percent of its population including its six largest cities: Portland, Eugene, Salem, the state capital, and the cities of Gresham, Hillsboro and Beaverton in the Portland metropolitan area. Eight of Oregon's ten – and 16 of its 20 – largest cities are located in the Willamette Valley. The Willamette Valley contains most of Oregon's population; it extends from Portland in the north to Eugene in the south. The valley's numerous waterways, particularly the Willamette River, are vital to the economy of Oregon, as they continuously deposit highly fertile alluvial soils across its broad, flat plain. A massively productive agricultural area, the valley was widely publicized in the 1820s as a 'promised land of flowing milk and honey'. Throughout the 19th century it was the destination of choice for the oxen-drawn wagon trains of emigrants who made the perilous journey along the Oregon Trail. Today the valley is often considered synonymous with "Oregon Wine Country", as it contains more than 19,000 acres (7,700 ha) of vineyards and 500+ wineries. 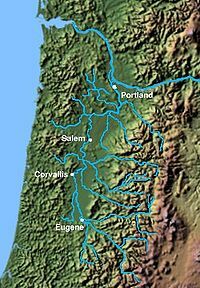 Much of the Willamette's fertility is derived from a series of massive ice-age floods that came from Lake Missoula in Montana and scoured across Eastern Washington, sweeping its topsoil down the Columbia River Gorge. When floodwaters met log- and ice-jams at Kalama in southwest Washington, the water caused a backup that filled the entire Willamette Valley to a depth of 300 to 400 feet (91 to 122 m) above current sea level. Some geologists suggest that the Willamette Valley flooded in this manner multiple times during the last ice age. If floodwaters of that magnitude covered Portland (elevation 20 feet (6.1 m)) in 2010, only the tops of the West Hills, Mount Tabor, Rocky Butte, Kelley Butte and Mount Scott would be visible, as would only some of the city's tallest skyscrapers. Elevations for other cities in the valley are Newberg, 175 feet (53 m); Oregon City, 138 feet (42 m); McMinnville, 157 feet (48 m); Salem, 154 feet (47 m); Corvallis, 235 feet (72 m); and Eugene, 430 feet (130 m). The lake gradually drained away, leaving layered sedimentary soils on the valley floor to a height of about 180 to 200 feet (55 to 61 m) above current sea level throughout the Tualatin, Yamhill and Willamette valleys. Geologists have come to refer to the resulting lake as Lake Allison, named for Oregon State University geologist Ira S. Allison, who first described Willamette Silt soil in 1953 and noted its similarity to soils on the floor of former Lake Lewis in Eastern Washington. Allison is also known for his work in the 1930s documenting the hundreds of non-native boulders (called erratics) washed down by the floods, rafted on icebergs and deposited on the valley bottom and in a ring around the lower hills surrounding the Willamette Valley. One of the most prominent of these is the Bellevue Erratic, just off Oregon Route 18 west of McMinnville. It is also believed that the Willamette Meteorite was rafted by flood and ice to the location near West Linn where it was found in 1902. The valley may be loosely defined as the broad plain of the Willamette, bounded on the west by the Oregon Coast Range and on the east by the Cascade Range. It is bounded on the south by the Calapooya Mountains, which separate the headwaters of the Willamette from the Umpqua River valley about 25 miles (40 km) south of Hidden Valley. Interstate 5 runs the length of the valley, linking its major communities. Because of differing cultural and political interests, the Portland metropolitan area and Tualatin River valley are often not included in the local use of the term. Additionally, the east slopes of the Coast Ranges and the west slopes of the Cascade Range from Oakridge to Detroit Lake can be considered part of the Willamette Valley in a cultural sense, despite being mountainous areas. Cities in the valley include, from south to north, Cottage Grove, Eugene, Corvallis, Albany, Dallas, Salem, Keizer, McMinnville, Oregon City, Hillsboro, Portland, and St. Helens. Parts of the following counties, from south to north, lie within the valley: Douglas, Lane, Linn, Benton, Polk, Marion, Clackamas, Yamhill, Washington, Multnomah, and Columbia. Sometimes the area around Albany and Corvallis and surrounding Benton and Linn counties is referred to locally as the Mid-Valley. Marion, Polk, and other counties are sometimes included in the definition of the Mid-Valley. The climate of the Willamette Valley is Mediterranean with oceanic features. This climate is characterized by very dry and mostly cloudless summers, ranging from warm to occasionally very hot, followed by cool, rainy, and consistently cloudy winters. The precipitation pattern is distinctly Mediterranean, with little to no rainfall occurring during the summer months and over half of annual precipitation falling between November and February. Temperatures are predictable throughout the year, with daytime highs frequently reaching the low to mid 80s in the summer and the mid 40s in the winter. Lengthy stretches of 90 °F (32 °C) days occur every summer, occasionally reaching 100 °F (38 °C). Very cold days where the daytime high fails to rise above freezing are rare and may occur only two or three days per year, and occasionally not at all, especially in the lowest elevations of the valley. Temperatures of 5 °F (−15 °C) or lower occur only about once every 25 years. Spring and fall days are consistently between 50 and 70 degrees, with occasional surges of summer-like or winter-like temperatures that rarely last more than a week. Precipitation varies considerably across the valley and is closely correlated with elevation. Annual totals range from 36 inches (910 mm) at the lowest elevations to more than 80 inches (2,000 mm) in the foothills. Eugene, at the southern end of the valley, is 425 feet (130 m) above sea level and receives 46 inches per year. Conversely, at the northern end of the valley, Portland is 50 feet (15 m) above sea level and receives only 36 inches per year. Annual snow accumulation mimics this pattern, with most locations averaging 3 to 5 inches (7.6 to 12.7 cm) per year, although some winters receive no snowfall whatsoever. Growing seasons are long, averaging 150 to 180 days per year in the lowlands to about 110 to 130 days at elevations above 800 feet (240 m). Severe storms of any kind are rare, although snow and ice storms can sometimes occur when surface low pressure systems move south along the coast, inducing offshore flow which advects cold air from the Columbia Basin westward through the Columbia River Gorge, filling the valley to the north of the surface low track. Weather systems sometimes bring high winds to the northern region of the valley. Average cloud cover can exceed 70 percent in winter but drops to less than 15 percent in summer. The agricultural richness of the valley is partly due to the Missoula Floods that inundated the valley approximately 40 times between 15,000 and 13,000 years ago at the end of the last ice age. The floods were caused by the periodic rupturing of the ice dam of Glacial Lake Missoula, the waters of which swept down the Columbia River and flooded the Willamette Valley as far south as Eugene. The floodwaters carried rich volcanic and glacial soil from Eastern Washington, which was deposited across the valley floor when the waters subsided. The soil in the Willamette Valley is about 1⁄2 mile (1 km) deep in some areas. The major agricultural products of the valley include many varieties of berries and vegetables. The valley also produces most of the grass seed, Christmas trees, and hazelnuts sold in North America. It is also noted for its hops, which are widely used in craft beer and microbreweries throughout the U.S. But it is greenhouse and nursery stock that have become the biggest agricultural commodity in the valley. In recent decades, the valley has also become a major wine producer, with multiple American Viticultural Areas of its own. With a cooler climate than California, the gently rolling hills surrounding the Willamette are home to some of the best (and most expensive) Pinot noir in the world, as well as a high-quality Pinot gris. Although this distinction is not officially recognized, many wine connoisseurs further divide the Willamette Valley into northern and southern regions, the dividing line being the approximate latitude of Salem (approximately 45° north latitude). Not all portions of the Willamette Valley are suitable for vineyards, however, and the largest concentration of wineries is found west of the Willamette River, on the leeward slopes of the Coast Range, or among the numerous river and stream valleys created by Willamette River tributaries. By far, the largest concentration of wineries is in Yamhill County. The Willamette Valley is prone to periodic floods. Notable floods include the Great Flood of 1862, events in 1899, the Christmas flood of 1964, and the Willamette Valley Flood of 1996. Part of its floodplain is a National Natural Landmark called the Willamette Floodplain. Historically, the Willamette Valley forests were mostly an oak savanna—tall grasslands with scattered Garry oaks and groves of coast Douglas-fir. The river floodplains contained extensive wetlands, stands of willow, alder, and cottonwood, and gallery forests. This landscape was maintained by the Native American inhabitants of the valley who set frequent fires that encouraged the open grasslands and killed young trees. The American settlers of the region, since the 19th century, suppressed fires and converted much of the valley to agriculture, which has caused much of the former grassland and savanna to revert to closed-canopy forest. Less than one-tenth of one percent of the original savanna vegetation remains. The remaining enclaves include a section of Garry oak savanna preserved at Mount Pisgah Arboretum in Eugene. North Pacific Oak Woodland is a major forest alliance, extending through the Willamette Valley and southward to the Klamath Range of Northern California. Many of the soils are well-drained mesic. Human habitation in the Willamette Valley is estimated to have begun between 6,000 and 10,000 years ago. Until recently, the valley was largely inhabited by bands of the Kalapuya tribe of Native Americans. Molala and Chinook peoples also have inhabited portions of the Willamette Valley since time immemorial. Sixteen thousand Kalapuyans are estimated to have populated the valley as recently as the early 19th century. As many as 90% of the Kalapuya may have died as a result of an epidemic of "fever and ague" that hit the area between 1830 and 1833. Salmon, deer and camas bulbs have provided primary food sources for the valley's first residents who used fire to encourage persistence of oak savanna. Oak trees have supplied another staple in the form of acorns which are leached, cooked and eaten. Kalapuya, Chinook and Molala peoples of the Willamette Valley currently are included among the confederated tribes that make up the Grand Ronde and Siletz Nations. After reports of the Lewis and Clark Expedition were published in about 1807, a small and steadily increasing stream of isolated pioneer groups began settling the valley and improving routes from the east set up by fur traders and mountain men. From the 1841 Oregon Trail opening, when the effort of many years finally widened the fur traders' mule trails into an improved rough road just capable of carrying the width of a wagon, settlers charged into the region along the new trail, creating new settlements centered about Oregon City as the early capital, even before ownership of the region was settled. So many people came that the valley led the way to achieving statehood less than 16 years after it was claimed by the United States in 1846. A small part of the Willamette Valley ecoregion is in southwestern Washington around the city of Vancouver, which was once the site of an early colonial-era settlement—Fort Vancouver. The Willamette Valley—served with its sawmills, lush productive farms, handy river transport network, and nearby timber and mineral resources—developed naturally as a cultural and major commercial hub, as the Oregon Country became the Oregon Territory. The Hudson's Bay Company controlled the fur trade in the valley and the rest of Oregon Country in the 1820s and 1830s from its Columbia District headquarters at Fort Vancouver. Joint U.S.–British occupancy, in effect since the Treaty of 1818, ended in 1846 with the Oregon Treaty. The Willamette Valley was connected to California's Central Valley by the Siskiyou Trail. The first European settlements in the valley were at Oregon City and Champoeg. The first institution of higher learning on the West Coast, today's Willamette University, was founded in the valley at Salem by Jason Lee, one of the many Oregon missionaries who settled in the valley. David Brin's book The Postman (which was adapted into a film of the same name) is largely set in the Willamette Valley, aka Hidden Valley, mostly around the city of Corvallis. S. M. Stirling's Emberverse series takes place mainly in the Willamette Valley, when technology such as electricity, guns, explosives, internal combustion engines, and steam power stops working on March 17, 1998. Portland and Corvallis figure heavily in the series. In the movie A League of Their Own – directed by Penny Marshall – Geena Davis and Lori Petty's characters are discovered playing softball and living on a dairy farm in the Willamette Valley. In Terry Brooks's novel series The Genesis of Shannara, the elf land of Cintra is located in "Willamette". The books of historical-fiction author Herbert Arntson are mostly set in the Willamette Valley. The popular 1985 video game The Oregon Trail depicts the journey of a group of pioneers traveling the Oregon Trail from Independence, Missouri to settle in the Willamette Valley in 1848. ^ "Willamette Valley Facts and Figures - Willamette Valley Wineries". willamettewines.com. Retrieved 29 April 2018. ^ a b c Cataclysms on the Columbia, by John Elliott Allen and Marjorie Burns with Sam C. Sargent, 1986. Pages 175–189. ^ a b c Geology of Oregon, by Elizabeth L. Orr, William N. Orr and Ewart M. Baldwin, 1964. Pages 211–214. ^ "Mid-Valley Our Town". Albany Democrat-Herald. Retrieved September 4, 2008. ^ a b c d Taylor, George. "Climate of Multnomah County". Oregon Climate Service, Oregon State University. Archived from the original on 2010-06-24. Retrieved May 31, 2010. ^ Allen, John Eliot; Burns, Marjorie; Sargent, Sam C. (1986). Cataclysms on the Columbia : a layman's guide to the features produced by the catastrophic Bretz floods in the Pacific Northwest. Portland, OR: Timber Press. ISBN 0-88192-067-3. ^ "Hazelnut Production (8/26/96), USDA NSS report". cornell.edu. Retrieved 29 April 2018. ^ Patrick Comiskey (October 3, 2008). "Oregon's lush Willamette Valley offers a vintners' bounty". The Los Angeles Times. Retrieved March 29, 2010. ^ "The Best Pinot noir in California? : Tasting Pinot Days 2009". Vinography. June 29, 2009. Retrieved March 29, 2010. ^ "Wine Spectator's Top 100 at a Glance" (PDF). Wine Spectator. 2007. Retrieved July 13, 2010. ^ "Answers - The Most Trusted Place for Answering Life's Questions". Answers.com. ^ "Map page - Oregon's North Willamette Valley wine region and wineries". winesnw.com. ^ Paul Holvey. "Chief Sponsored Bills". Enacted Legislation Sponsored by Paul Holvey. Retrieved March 25, 2011. ^ Repko, Melissa (July 17, 2009). "Willamette Valley grass seed growers brace for future without field burning". The Oregonian. ^ Evans-Hatch, Gail E.H. and Michael Evans-Hatch (May 1999). "The Development of Sellwood-Moreland: History Context Statement of the Sellwood-Moreland Neighborhood, Portland, Oregon" (PDF). Oregon.gov. Retrieved July 4, 2017. ^ "The Oak Savannas of Home". Greenbelt Land Trust. 2012-09-04. Retrieved 2017-07-05. ^ a b c Research, David G. Lewis' Ethnohistory; LLC (2017-07-03). "Help fund My Book Project: Tribal Stories of the Willamette Valley". NDNHISTORYRESEARCH | Critical & Indigenous Anthropology. Retrieved 2017-07-05. ^ a b Staff, Library. "LCC Research Guides: The Kalapuya: Native Americans of the Willamette Valley, Oregon: Home". libraryguides.lanecc.edu. Retrieved 2017-07-05. ^ Staff, Library. "LCC Research Guides: Stories of the Chinook People: Home". libraryguides.lanecc.edu. Retrieved 2017-07-05. ^ Whitlock and Megan Walsh, Kathy (March 2010). ""Tracing the History of Fire in the Willamette Valley"" (PDF). Fire Science Brief. Retrieved July 4, 2017. ^ Elder, J. Tait (2010). "Exploring Prehistoric Salmon Subsistence in the Willamette Valley using Zooarchaeological Records and Optimal Foraging Theory". PDXScholar (Dissertation and Theses. Paper 22). Retrieved July 4, 2017. ^ Verne, Ray (May 1938). "Lower Chinook Ethnographic Notes". University of Washington Publications in Anthropology. 7 (2): 29–165 – via University of Washington Libraries. ^ "Siletz Indian Tribe History, Tillamook Oregon, Multnomah County Oregon, Salishan - Part I - Introduction". www.ctsi.nsn.us. Retrieved 2017-07-05. Loy, William G., ed. ; Allan, Stuart; Buckley, Aileen R.; and Meacham, James E. (2001). Atlas of Oregon, 2nd ed. Eugene, Oregon: University of Oregon Press. ISBN 0-87114-101-9. MacGibbon, Elma (1904). Leaves of knowledge. Shaw & Borden Co. Elma MacGibbons reminiscences of her travels in the United States starting in 1898, which were mainly in Oregon and Washington. Includes chapter "Willamette Valley." O'Connor, J.E., et al. (2001). Origin, extent, and thickness of Quaternary geologic units in the Willamette Valley, Oregon [U.S. Geological Survey Professional Paper 1620]. Reston, VA: U.S. Department of the Interior, U.S. Geological Survey. Wikimedia Commons has media related to Willamette Valley.